Hey again! I'm back from a long movie drought, thanks to unexpected and joyful winter employment, and ready to kickstart this blog back into shape. How am I only on the fifth movie? This goal seems to grow rather than diminish as I watch on. How can that be? 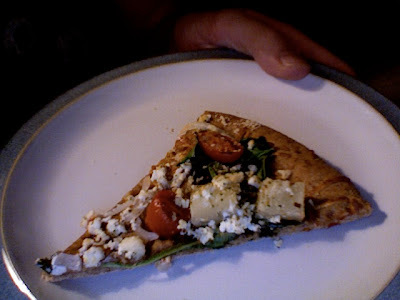 The pizza was delicious ... and, as it turned out, cinematically appropriate. But enough about the feast -- onto the flick! 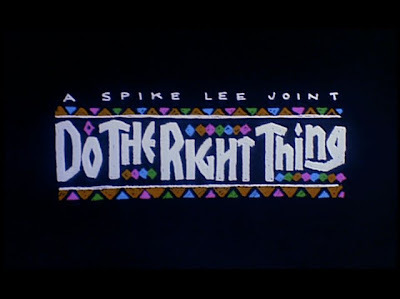 This weekend I saw a movie that had been on my Netflix queue for a good long while: Spike Lee's 1989 joint Do the Right Thing, which was very controversial when it hit theaters during the first Bush administration. Upon further research, the title comes from a Malcolm X quote -- simply, "You've got to do the right thing." What that 'right thing' is exactly becomes a key point for discussion late in the film. Also: our current President and First Lady saw this movie on their first date. Talk about heavy! This film also holds the embarrassing honor of being the only film on the AFI's list directed by a black man. (Sorry ladies -- there's not even one picture directed by a woman.) No more needs to be said on the matter except: wake up, AFI, and see the world of cinema that's not directed by straight, old white men. Moving on. This is just such a money shot, I had to include it. Intimacy: staying cool on such a hot day. The film opens with a saxophone (the score is by jazzman Branford Marsalis) and Rosie Perez doing angrier variations on the Roger Rabbit in late 80s fashions to Public Enemy's "Fight the Power." At first, this opening sequence is strange and almost laughable, but it becomes clear by the end of the film that it's an expression of a deep-rooted frustration. I only wish it hadn't taken so long to get to that conclusion. 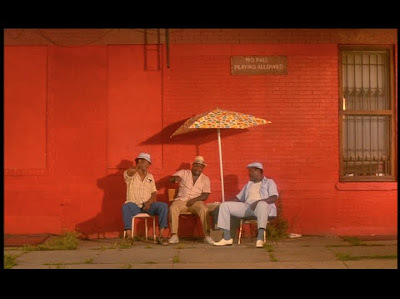 We are introduced to several characters on a single street in Bedford-Stuyvesant, in Brooklyn, most of whom are African-American or Puerto Rican. In fact, for the first half of the movie, most of what we're seeing is introduction, mood setting, imagery ... and not a whole lot of story. I'm fully a believer that we can see nothing happen and it can be fascinating, but I'll admit my patience was wearing thin with the story by the hour mark. Portions of this hour-long prologue to the major events of the movie played like Altman, as though we were seeing Nashville (luckily, on my AFI list!) set in Brooklyn. Mother Sister (Ruby Dee) "always watches." 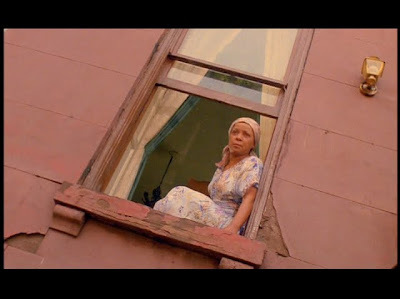 The story follows Mookie (Spike Lee, the star and director), father to a child with Tina (Rosie Perez) and delivery boy for Sal's Famous Pizzeria, run by Sal (an archetypal but fantastic Danny Aiello), an Italian-American who has supplied the neighborhood with pizza for 25 years. He and the Korean grocer across the street are the only suppliers of food on the street, something noted by a sort of Greek chorus of old men sitting against a bright red wall near the pizzeria. Their dialogue (mostly improvised) and the wall foreshadow danger, even on a cloudless, sunny, and sweltering hot day. The men make note of the fact that there are no black-owned businesses on the street, and the Koreans "haven't been off the boat for a year" before their market is a thriving business. This was when I realized: maybe this film won't be about any event. Maybe it will just be about making observations on the injustice of the African-American experience of the late 80s. Well ... I was sorta half-right. Without spoiling everything, let's just say that small tiffs grow into miscommunication and misunderstanding, which grow into big tiffs, and lives are changed forever. You get the sense by the end that the tight-knit neighborhood will never be quite the same. But I think part of the genius here is that the plot is merely a jumping off point for many snapshots of simple, covert (and overt) racism and oppression. The Italians telling Mookie to "talk some brother talk" to his black friend, as a way to calm him. The local youth harassing a white man who bought a brownstone in the neighborhood. Whites saying that Magic Johnson, Eddie Murphy and Prince are "more than" black, that they transcend their race. There's even a scene that's simply one character of each race rattling off racial epithets against someone else. No one is innocent, everyone is racist. This brings us to what I think is most important about this movie: Spike Lee has made a movie about race that doesn't take sides. No one gets off free and clear at the end. Racism is everyone's problem, and everyone has to deal with the consequences. This neighborhood is full of immigrants, some who were born here and some who were born elsewhere, who all want a right to turf, a right to life. They're all fully committed to protecting their honor and their pride, and no one is in the wrong. So if no one is in the wrong and no one gets off scot-free, who did the right thing? Did Mookie do the right thing? Did Sal? 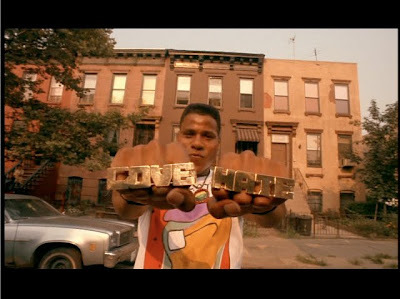 Did Radio Raheem? Who's our antagonist? Lee offers no simple answers, but rather hopes to facilitate a discussion. He ends the film with two distinctly different quotes -- Martin Luther King, Jr. advocating non-violence, and Malcolm X advocating violence as self-defense. Two quotes, two radically different schools of thought, but both stemming from the same problem, the complex problem that Do the Right Thing hopes to illustrate, probe and dissect. How does it do? I'll leave that to you, because honestly, as much as this movie has been on my mind the last 24 hours, my head is spinning and I need some time to digest it. Next up: #95. Peter Bogdanovich's The Last Picture Show.